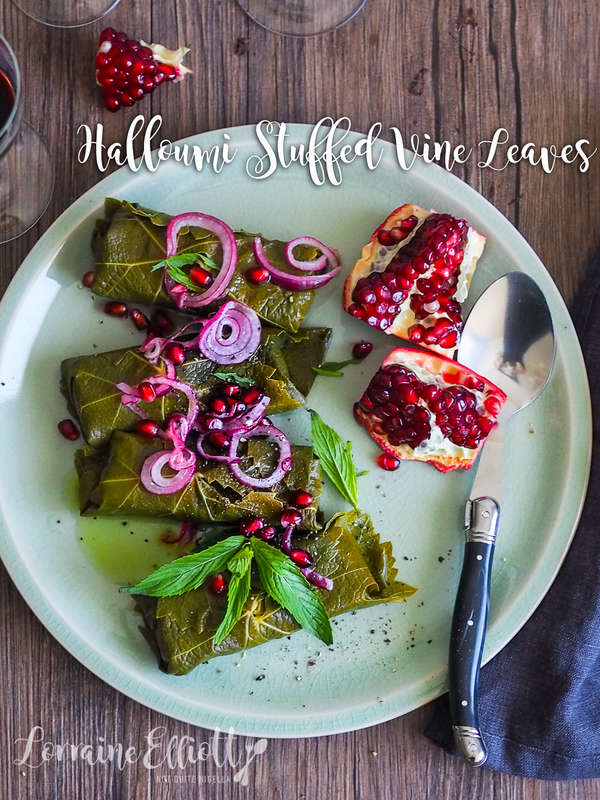 When my friend Louise furnished me with vine leaves from her parents' vineyard and farm, I knew that I'd have fun making these halloumi wrapped vine leaves. 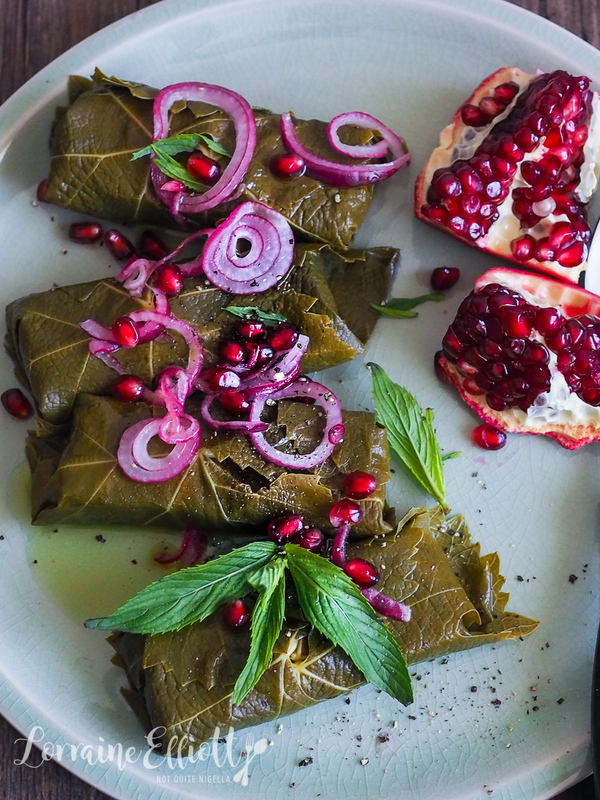 They're lighter than the rice stuffed version but this dish is made even more delicious with easy pickled red onion and pomegranate seeds! I saved the vine leaves for when Nina and Garth were coming over to our apartment for dinner. Because Nina is such a fussy eater I have to check if she will like something before I make it so I asked her if she likes dolmades. She thought about it for a hot second before replying in the negative. "I feel as though things wrapped up nicely should be a nice surprise but when I see that it's just rice in vine leaves, I'm disappointed," she said. I've got a few other things in the kitchen after the Christmas period so I thought I'd share them as part of the In My Kitchen series hosted by the lovely Sherry. These are some of the edible Christmas gifts that I received. 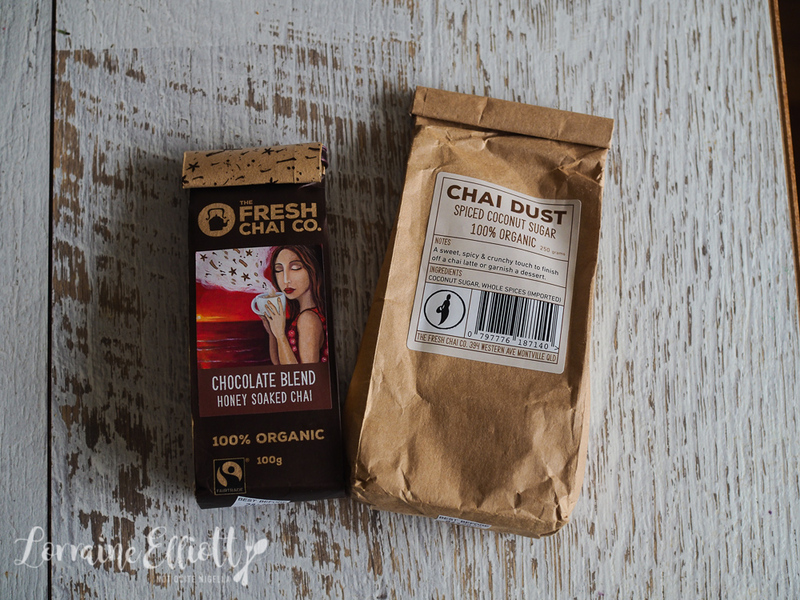 The first is a chai mix and spiced coconut sugar from Dear Reader and friend Jaqi. She knows how much I love chai and this is a sticky chai mix that you boil up in a saucepan and add milk to. It's fantastic, especially with the spiced coconut sugar too and it's for people that like strong spices in their chai. The second lot of items are from my sister Blythe. She lives in London and she always brings home from her travels. The Christollen on the left is from an Austrian restaurant I had visited a few years ago called Zum Schwarzen Kameel (the black camel). It's was a fairly dry stollen but I ended up making French toast out of it and it was delicious because it had all of the added spices in it already. 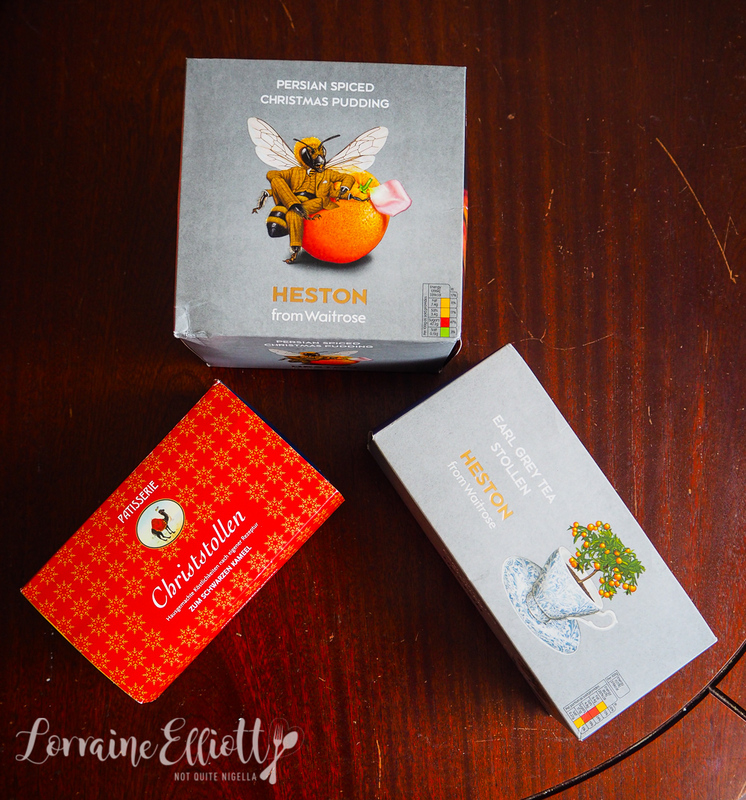 The square box above that is the Heston Persian spiced Christmas pudding with a liquid honey centre that was quite good (although I preferred the one with the whole orange in the centre). 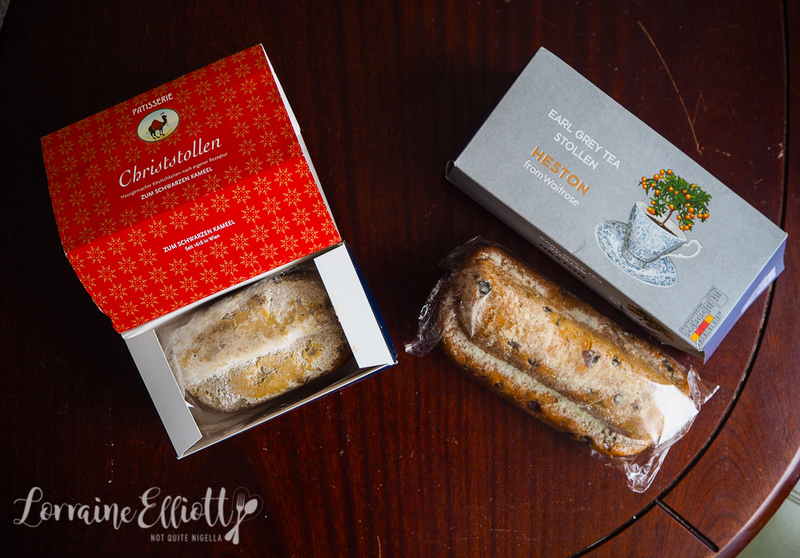 The item on the right was my absolute favourite of the lot: an Earl Grey tea stollen. There wasn't a very strong Earl Grey or bergamot flavour but it was so laden with fruit and marzipan that Mr NQN ate the entire thing except for what we tried, in one go. The next items are from my mother in law Tuulikki. She gave us a lovely Christmas gift. 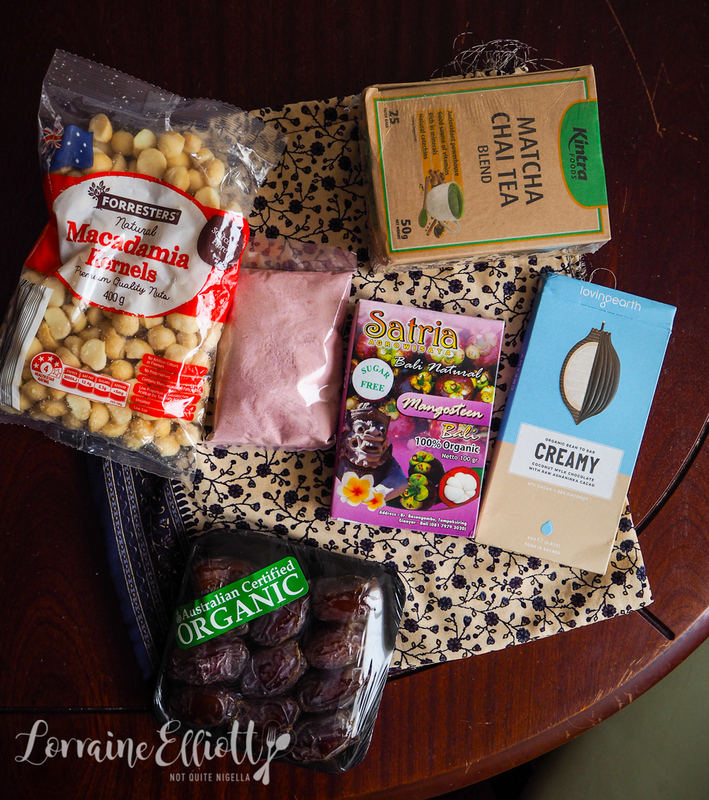 In it are macadamia nuts, fruit mix, dates, matcha chai tea and a healthy chocolate. The fuchsia coloured powder is a herbal tea made of mangosteen rind which is quite nice. It was a bit of a mystery to me at first because when I got home and examined it there was no information on the box. It's mildly sweet and tastes like a fruity herbal tea. If anyone has any suggestions on what to do with that apart from drink it, please let me know! So tell me Dear Reader, did you get any interesting food presents for Christmas? What do you think of dolmades? Do you agree with Nina? Tip: make sure you rinse your vine leaves very, very, very well (did I use enough verys? ;)). My point is that halloumi is salty enough on its own and vine leaves are often packed in a salted solution. If you don't they'll be way too salty and inedible (I learned the hard way when I tested one out). Step 1 - First make the pickled onion. Place the thinly sliced onion in a bowl and mix with the rice wine vinegar and sugar. Allow the sugar to dissolve and the onion to soften. Step 2 - Cut the halloumi block into 8 rectangular pieces. 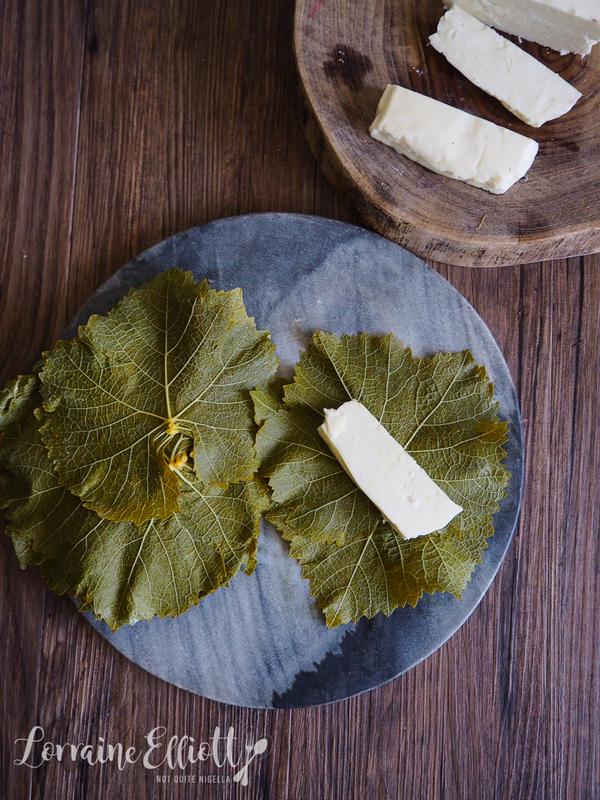 Place three vine leaves on a chopping board, overlapping each other. Place the halloumi in the centre and start rolling wrapping up on both sides. You can do this a day in advance and keep it covered in the fridge. Step 3 - Preheat oven to 180C/350F and bake the stuffed vine leaves for 7 minutes. 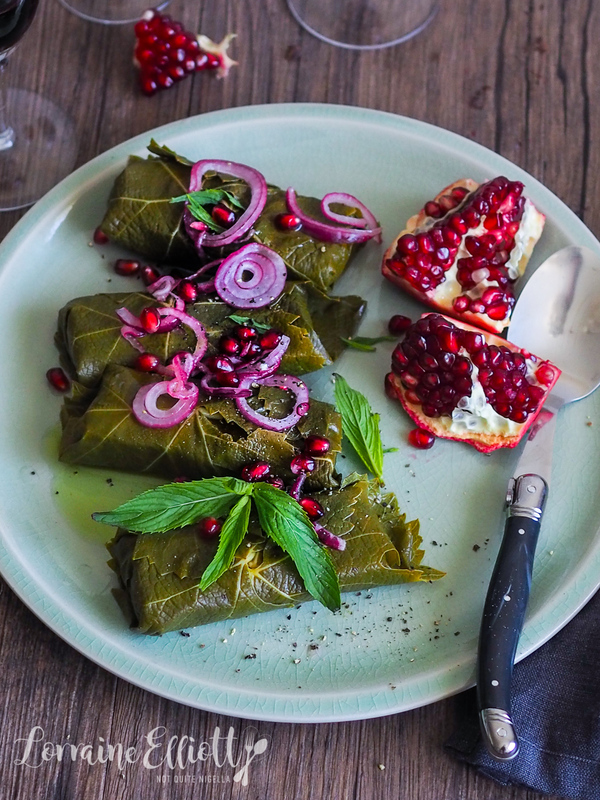 Place on a serving plate and top with pickled onions, pomegranate seeds and mint.